Researchers have determined that precipitation and temperature variations over the past 20 years have suppressed the U.S. average soybean yield gain — how much it goes up every year — by about 30 percent, representing a loss to the industry of $11 billion nationally. In Ohio alone, that suppression is estimated to have cost $2.9 billion during the past 20 years, according to a new study co-authored by OARDC scientist Laura Lindsey, pictured, assistant professor in the Department of Horticulture and Crop Science. “During the past 20 years, temperature and precipitation have been changing, and that change is associated with yield reductions and economic loss that is region-specific,” she said. The study found that for every 1 C (1.8 F) rise in temperature during the growing season, soybean yields fell by about 2.4 percent. Global annual temperatures have increased by 0.4 C (0.72 F) since 1980, and several regions have seen even greater increases, Lindsey said. 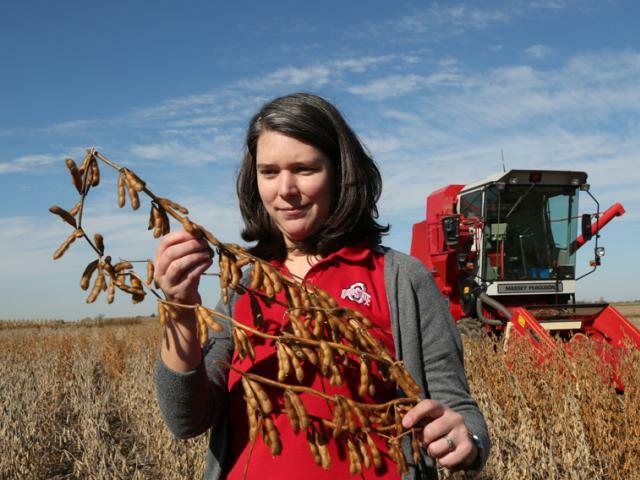 Ohio was the second-hardest hit state after Missouri in terms of lost soybean income over the past 20 years, she said. To contact the scientist: Laura Lindsey at lindsey.233@osu.edu.